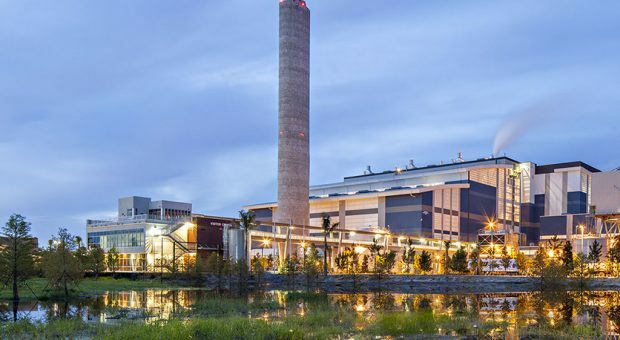 The new SWA Waste-to-Energy Facility in Palm Beach County produces electricity from waste, reduces landfilling by over 90%, displaces the need for fossil fuels and powers approximately 44,000 homes. The Studio developed the conceptual aesthetic and environmental design for this new $700M Facility, assisted in establishing design criteria, and was involved in design and implementation oversight throughout the construction process. The SWA and Singer Studio goal was to utilize aesthetic enhancements, environmental design and educational outreach to create a place that engages the public and presents itself as a locus of civic pride and commitment to the environment. The Singer Studio conceptual design included numerous aesthetic, functional, environmental and educational elements and programs that have been incorporated into the built project. Large areas of translucent panels are integrated with the primary facades to naturally light interior spaces and in specific areas allow for views into the facility. A skybridge connects tour groups from the LEED Platinum Visitors Center to the main process building to witness the internal waste-to-energy process. The entire facility is designed as a singular rainwater harvesting system to capture and store two million gallons of rainwater for use within the waste-to-energy process and for site irrigation. This harvesting system, combined with air-cooled condensers and the re-use of wastewater from an adjacent facility, creates one of the most innovative industrial water systems in the nation. As a result the facility uses no potable water in its process and produces zero (or net negative) waste water. The air-pollution controls in this new facility are also the most advanced and the cleanest compared to any similar facility in the nation. Other notable features of the design are the extensive use of green walls, an innovative oval stack to minimize visual impact, a naturalized landscape and advanced stormwater management practices. The new Visitor’s Center includes an engaging interactive multimedia tour and exhibit area for the general public and school groups. The interactive educational tour emphasizes the importance of recycling, waste reduction and proper handling of household hazardous waste such as compact fluorescent light bulbs and batteries that contain mercury. By addressing potential pollutants at their source, education is a key component of the SWA’s commitment to the environment. The interactive multimedia tour and exhibits were created by Potion and Art Guild; the video below courtesy of Potion shows some highlights of the exhibit.